Friends Anne, Matt and me in Assisi, in front of the church dedicated to St. Francis of Assisi. Can you imagine how special this day was for me?? When I was young and very young I was told to pick a saint for my confirmation. I picked St. Francis of Assisi because he was the patron saint of animals (did I mention I was young?). They say that when one picks a confirmation saint, not only are you inspired by that saint, but they pray for you in a special way. Now, years removed from my confirmation, I’m consistently touched by how often I see the hand of St. Francis in my daily life. I love my New Year’s Retreat—run by Franciscans. I attend mass at a parish staffed by Franciscans, I confess to a Franciscan. Last year I was able to visit Assisi, St. Francis’ grave, and the streets he walked so many years ago. There are times when I realize these random Francisan-ties and I smile internally because I feel that he, my confirmation sponsor, must be watching out for me, praying for me, and pulling strings for me. It’s kind of incredible. I love so many things about St. Francis of Assisi… mostly, I think, because I wish I was more of what he is. If you wish to be perfect, go, sell what you have and give to [the] poor, and you will have treasure in heaven. Then come, follow me. Francis heard those words… really heard them. And, what’s more, he acted on them. He gave up what he had, he brought the news of Jesus to the world, he embraced poverty, suffering, and joy. 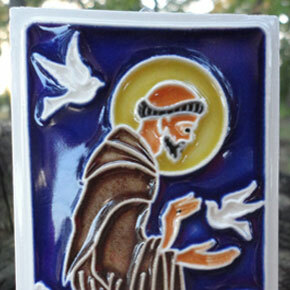 Tile of St. Francis of Assisi that I bought IN Assisi. I wish I was better at being his confirmation-kid. I wish I could follow like he does, but I don’t know how. I live in a world with a broken system for meat processing, I know this is not right. I have friends in developing countries who don’t make fair wages, but I don’t know how to address that. I, too, know the words of Jesus, but I am afraid to follow them as closely. My culture is so counter-Francis. We’re taught to accumulate, to impress, to take. We’re taught that things are disposable, but even our things are more important than the people around us. I still love his love of the natural world—-I, too, want to be good to our animal brethren. I am so inspired by his total, authentic dedication to the words of Jesus. When I hear stories of his kind heart I hold my breath for a second… this is what I want my heart to look like, too. I wish that I had his total faith in the words that Jesus spoke. I pretend like I do, but I know that I don’t. So today, St. Francis, pray for me in a special way. Please help me do a better job at this. BTW, I read a part of this article and thought it was interesting. FYI.